Many guests ask us how to dress for our local climate, both in summer and winter. With our temperate climate in summer, you can expect temps in the 50's, 60's, 70's, and even 80's, but it's dry so you won't ever be bothered by humidity. In winter, the temps can commonly be in the teens and 20's, but warm fronts sometimes will blow in from the Pacific bringing temps up into the 30's, 40's & even low 50's for brief periods (we don't like that at all because it melts our snow!). Sub zero temps can be found, ranging as low as -30 or -40 for brief periods, typically just in January or early February. This is an experience in itself, and a perfect time to head into a heated ice house for fishing, or better yet a hot authentic Finnish sauna for the therapeutic effects of this traditional Finnish cure all. Our recommendations for summer include: breathable fabrics that offer moisture wicking and comfort, both in terms of tops and pants, so regardless of your adventure you are comfortable and dry. For general walking and hiking, any comfortable athletic shoe or hiking boot will do, but for fishing charters we recommend an ankle or knee high rubber shoe or boot to protect your feet from water on the deck of the boats. Dressing in layers is the best plan, with a t-shirt for sunny weather, shorts or zip off pants if you like, but a fleece jacket, wind breaker, and even some lightweight gloves and a hat for early mornings. Sunscreen and mosquito juice are good to have handy too. In winter we recommend: breathable warmer fabrics like fleece, wool, and any variety of new high tech winter wear. Layers so you can shed or add warmth as needed. Warm hats with ear protection, balaclavas for snowmobiling or very cold activities, warm gloves, wool blend socks, sun glasses and even sunscreen for bright reflective light in February and March, but no worries about mosquitos this time of year! 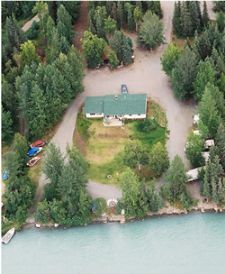 The Kenai Peninsula has a coastal climate that is mild, with abundant rainfall. It is one of the few areas in Alaska that allows for agriculture, with a growing season adequate for many crops. With our temperate climate, you can expect most days in summer to be in a pleasant 60~80 degree range, perfect for outdoor activities, without getting too hot. Occassional rain, rarely heavy, but somewhat cool will likely feel refreshing for most visitors coming from hotter summer climates. Winter arrives in October generally, with our first snow falling between the 15th and 31st of the month generally, as temperatures begin to stay in the 20's and 30's. Heavier snows will likely come in November and December, blanketing the landscape and enabling easy access via the frozen expanse that you can't enjoy any other time of year. We typically have 3-4 feet of snow on the ground throughout the winter months in Soldotna, with much deeper snow in the mountains of Cooper Landing and Summit Lake. January is our coldest month, with temperatures dipping into the sub zero realm and daylight shrinking to just under 6 hours per day. February~March is our favorite time in winter, as daylight rebounds and grows quickly by more than 5 minutes a day until, just after daylight savings time in early March, our days are lasting more than 12 hours, ample time to enjoy a wide range of winter sports and activities. By mid April the snow has melted and begins to give way to the greening of early May. The Kenai Peninsula extends approximately 150 miles (240 km) southwest from the Chugach Mountains, south of Anchorage. It is separated from the mainland on the west by the Cook Inlet and on the east by the Prince William Sound. Most of the peninsula is part of the Kenai Peninsula Borough. Gerasim Izmailov was the first to explore and map the peninsula in 1789. The Kenai Peninsula is littered with glaciers on its eastern portion. It is home to both the Sargent Icefield and Harding Icefields and numerous glaciers that spawn off them. Winter recreation opportunities include cross-country skiing, dog mushing, trapping, snowmobiling, ice fishing and more; while summer on the Kenai Peninsula is most famous for world-class salmon, trout & saltwater fishing, camping, hiking, hunting, berry-picking, boating, sailing, horseback riding, clamming, flying, all in practically endless daylight.